Although the affordable housing crisis is receiving a lot of attention in Portland, high rents are a growing statewide problem. According to newly released figures, 29% of Portland households pay more than half of their income for rent, making them severely rent burdened and Wilsonville is not much farther behind, with 17.6%. But the most severely burdened city in Oregon is Corvallis, where 40% of households pay more than half of their income for rent. Other cities with more severely burdened households than Portland include Eugene at 38%, Lebanon at 36%, and both Ashland and Grants Pass, each at 33%. In fact, Portland is not even the most severely burdened city in the metropolitan area. That is Gladstone at 35%, followed by Gresham at 34%, Troutdale at 33%, Forest Grove at 31% and Tigard at 29%. 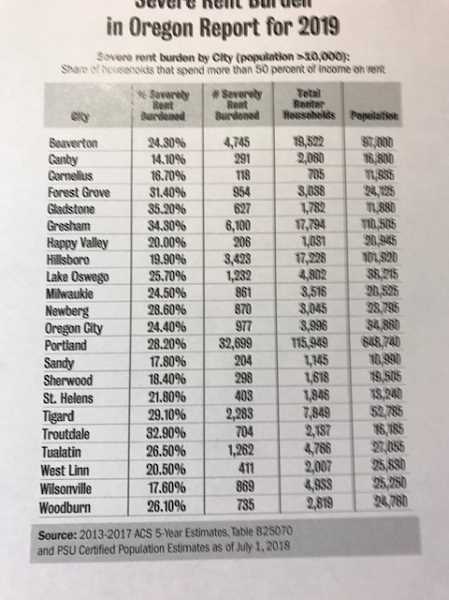 The city with the lowest share of severely burdened households in both the state and metropolitan area is Canby at 14%. "Communities of many different sizes are experiencing housing burdens and difficulties, said Carrie McLaren, deputy director of the state Department of Land Conservation and Development, which worked with Oregon Housing and Community Services to compile and analyze the figures. While Wilsonville and Lake Oswego have close to the same number of renters, 4,933 versus 4,802, the affluent suburb of Lake Oswego has a higher percentage of burdened renters — 25.7% — most likely due to the lack of affordable options. The figures were compiled from U.S. Census data by OHCS as required by House Bill 4006, which was approved by the 2018 Oregon Legislature. The agency found that 30 Oregon cities are severely rent burdened in 2019 — which means more than a quarter of their renters pay more than half their incomes for housing. The number of severely burdened cities in Oregon hadn't changed since the first analysis completed last year. The bill also directs agencies to survey officials in all cities with more than 10,000 residents on a range of affordable housing issues, including whether a lack of affordable housing is considered a problem and what, if anything, they are doing to create more of it. Thirty-seven cities responded to last year's survey. A slight majority had between 10,000 and 24,999 residents. Among other things, the survey found that most cities — 70% — consider housing affordability as more or much more important than other issues facing them. Even more — 78% — said affordability is equally a problem in the rental and homeownership markets. "Housing is being seen as an increasingly important issue, and awareness about it affecting everyone is growing in every community," said OHCS Government Relations and Communications Liaison Ariel Nelson. The rankings are not a reflection of any city's commitment to addressing the affordability problem, said Nelson. She notes that Corvallis' top ranking may result from it being a college town with a high percent of low income students. High ranking Eugene and Ashland are also college towns, she said. Because Portland is by far the largest city in Oregon, it easily has the highest number of rent burdened households — 32,699 compared to second place Eugene with 12,540. But Portland also has more resources for dealing with the problem, including a requirement that 45% of all urban renewal funds be spent on affordable housing, a $258 million affordable housing bond approved by city voters, and the 38% share of Metro's voter-approved $653 million affordable housing bond that it is expected to receive. In contrast, Clackamas and Washington counties are only expected to receive 21% of the bond revenues each, the next largest shares. Other cities scheduled to receive smaller shares of the Metro funds are Beaverton (6%), Gresham (5%), and Hillsboro (7%). The balance of Multnomah County will receive 3%. Among other things, HB 4006 is intended to inspire conversations about affordable housing in the participating cities, including at a required community meeting every year. "We believe the meetings have been very productive. They've been attended by everyone from community leaders to community members experiencing rent burden, said OHCS Housing Integrator Kim Travis. Most cities also said they have a shortage of virtually all kinds of housing, including both family-size homes for rent and sale. The majority said they have a need for more housing affordable to households earning 120% or less of the area median family income. Forty-nine percent said they also have a shortage of homes affordable to households earning more than that. Seventy-six percent of cities said they lacked the tools to address housing affordability, however. Most — 84% — said a lack of funding was a moderate or extreme barrier to creating more affordable housing. Majorities also cited a lack of development-ready land, a lack of properly zoned land, the high cost of land, and high construction costs. And 73% said a lack of good-paying jobs was also a barrier to reducing the percent of rent-burdened households in their cities. Despite recognizing the problem, relatively few cities have done much to solve it. Although 27% have some form of emergecny housing assistance, only 13% have created an affordable housing trust fund and just 6% have issued bonds for affordable housing projects. Eighty-two percent do not even have a housing director. "The survey results really reflect the range of familiarity with housing issues and the tools to address them," Nelson said.